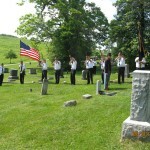 The Sons of Union Veterans of the Civil War Buckhannon Camp #49Â organized a dedication ceremony for the newly erectedÂ tombstone of Brevet General George R. Latham at Heavner Cemetery on Memorial Day.Â Latham was a prominateÂ officer during the Civil War and a prominate citizen afterward. 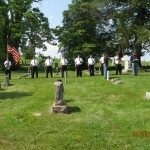 The Sons of Union Veterans of the Civil War (SUVCW) Buckhannon Camp #49 is a fraternal organization dedicated to preserving the memories of the veterans who fought to save the Union during the War of the Rebellion 1861-1865 and to the more than 300,000 Union soldiers who died preserving the government for, by and of the people. Brev. 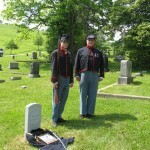 General George Robert Latham (March 9, 1832 â€“ December 16, 1917) was a nineteenth century politician and lawyer from Virginia now West Virginia. Born near Haymarket, Virginia, Latham attended common schools as a child, studied law and was admitted to the bar in 1859, commencing practice in Grafton. 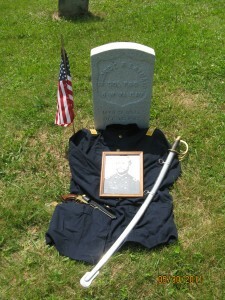 He was a delegate to the Wheeling Convention in 1861 and during the Civil War served in the Union Army as captain of Company B of the 2nd West Virginia Volunteer Infantry Regiment. Latham was later promoted to colonel before being elected an Unconditional Unionist to the United States House of Representatives in 1864, serving from 1865 to 1867. 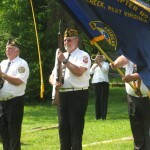 Afterwards, he was appointed consul at Melbourne, Australia in 1867, serving until 1870, was school superintendent of Upshur County, West Virginia from 1875 to 1877 and supervisor of census for the first census division of West Virginia. 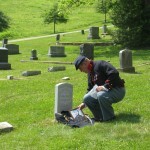 Latham engaged in agricultural pursuits until his death in Buckhannon, West Virginia on December 16, 1917. 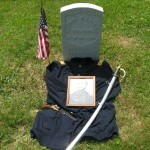 He was interred in Heavner Cemetery in Buckhannon. 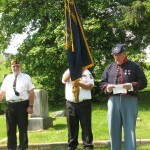 The SUVCW obtained and setÂ a military tombstone for Latham to assist in the preserving the memory of his service.Â The Create Buckhannon Committee is presently restoring Latham’s house as an historic landmark.Â The SUVCW would also like to thank the VFW Post #3663 and American Legion Post #7 for their assistanceÂ with the ceremony.